Going into Day 10 we all decided to make a slight change to our original plan which meant we would get to our rest day location, Elephant Sands, a day earlier allowing us two rest days. So we packed up camp at Woodlands Stopover and headed out on the A3 towards Nata. We had a tailwind behind us for most of the ride which meant we managed to clock in the kilometres a lot quicker than in the past few days. 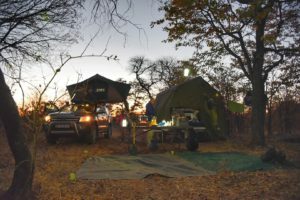 Once we reached the town of Motsetse which was around 108km we decided to call it a day and locate a bush camping spot in the area. We found a well-driven dirt road just off the main road and Warrick and Gareth went to see if they could find the owner of the land to get permission for us to setup camp there. They were successful and spoke to the owner called Mike who had no problem with us bush camping on his land. We found a relatively clear area surrounded by trees to setup the tents. Warrick was in his element and built a very decent fire for us for the night where we enjoyed our first experience of bush camping in the middle of nowhere. 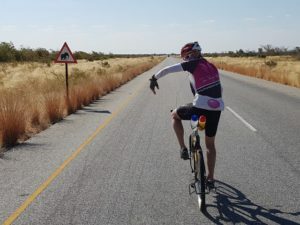 The next morning, we had to get up relatively early as we had a long ride ahead of us to get to Elephant Sands where we are now having two rest days (we all thought it was going to be around 110km but Warrick had miscalculated and it was actually 125km). Within the first 10km we started to see lots of Baobab trees and decided to stop to get a few photos. When we stopped, Gareth couldn’t unclip his shoe from the peddle as it turned out that one of the screws had fallen off. After a few attempts to get the shoe off he finally unclipped it but he needed to find a screw to put the cleat back into place on his shoe. Luckily, Gareth and Derrick managed to find a screw that they could saw down to size that was able to fix the problem. We then got back on the road and headed to the next main town which was Nata. As it was getting really hot (over 30 degrees) we decided to grab a quick ice-cream at the Engen garage. The boys were all still feeling hungry so we then ended up at Barcelos for a chicken burger and chips. We thought we only had around 40km to go until Elephant Sands from Nata but as Warrick had got the distances miscalculated it ended up being a further 54km to go. We were all feeling very full and sluggish after our burgers and ice-cream so it was mentally tough to get going again. 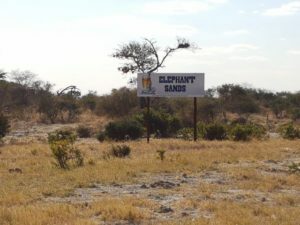 We were all really hoping to see some elephants whilst we rode on the Kasane road to Elephant Sands as we kept on seeing the signs but unfortunately none were to be seen except for some red hartebeest, a few cows and donkeys. 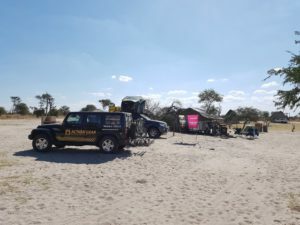 We finally made it to the Elephant Sands turnoff where Bobby met up with us as he had already gone ahead with the trailer to setup camp earlier in the day whilst Bryan followed us in the Jeep. Literally as we turned onto the dirt road, Derrick came crashing down as we hit very soft sand and so he decided to call it a day. 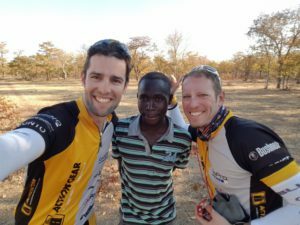 Cam managed to ride about halfway up the very sandy road before getting into the car but Warrick and Gareth deflated their tyres down so they could ride on the road all the way to camp. As we arrived at Elephant Sands there was a herd of elephants drinking by the waterhole. It was such a treat to see them after a hard day in the saddle. 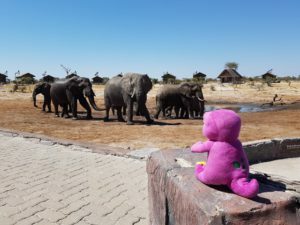 The lodge has a deck literally overlooking the waterhole so you are able to get really close to the elephants here which is amazing. We are staying here for two days to rest, sleep and enjoy some time in the African bushveld. Elephant Sands Wi-Fi has been down for the past week and thanks to Bryan he managed to help them fix the problem which has allowed us to update all our supporters again on our progress. 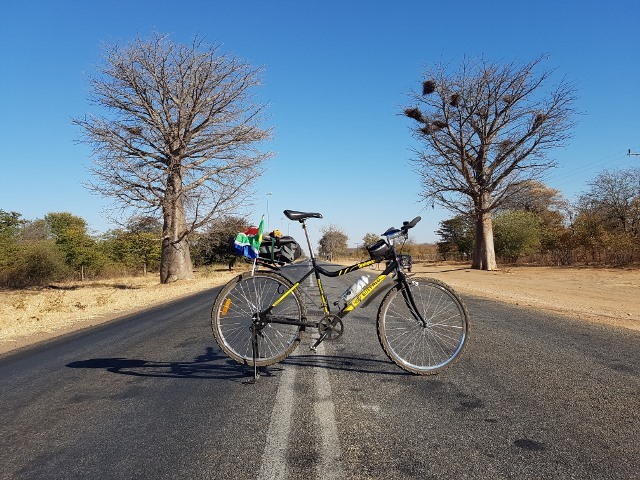 Tomorrow we will be back on the road again for about 100km of cycling up towards Pandamatenga where we will need to bush camp again. Looks awesome guys! Love the elephant pic 🙂 Enjoy the 2 rest days. Super deserved!